Some people are right where they belong. That is surely the case of Mike Long. Mike holds down the front desk at the offices of the Elkhart County Visitors Center. He has a cheerful greeting to all who walk through the door. He is attentive and helpful and is genuinely concerned about taking great care of those who come to Elkhart County. “Mike inspires people to be happy just by being in his presence. He’s the real deal and he makes everyone comfortable around him,” says Diana Lawson, the Chief Executive Officer of the Convention and Visitors Bureau. Others are quick to agree. Mike has an uncanny knack for relating to and helping others. His enthusiasm is contagious. Mike does not see it quite that way. “I am a positivity vampire,” he tells us. “I get my positivity from all the people who come into the office.” Mike then takes those good vibes, amps them up a notch or two and shares them with others. Mike’s positive and enthusiastic disposition is even more noteworthy because every day he deals with his affliction from Multiple Sclerosis. Mike was struck by this debilitating condition when he was a perfectly healthy man in his mid-twenties. Mike had always wanted to be in law enforcement. He had been hired by the Bristol Police and was working as an officer when MS hit him. He came to realize that he could not continue with his condition. It was not safe, for him, for his partner and for those they served. When Mike was offered the chance to work with Elkhart County’s visitors, he took it. He has embraced it and he is stellar. Mike has a profound love for Elkhart County and he is happy to share it along with all he knows about what to see and do here. Where would he send you? That depends on what you are interested in. Mike knows there is something for everyone in Elkhart County and he is pleased to point you in the right direction. Does he have one favorite place to go? If he does, he is coy about it. An ambassador has to be like that. Mike is one of Elkhart County’s true Champions. 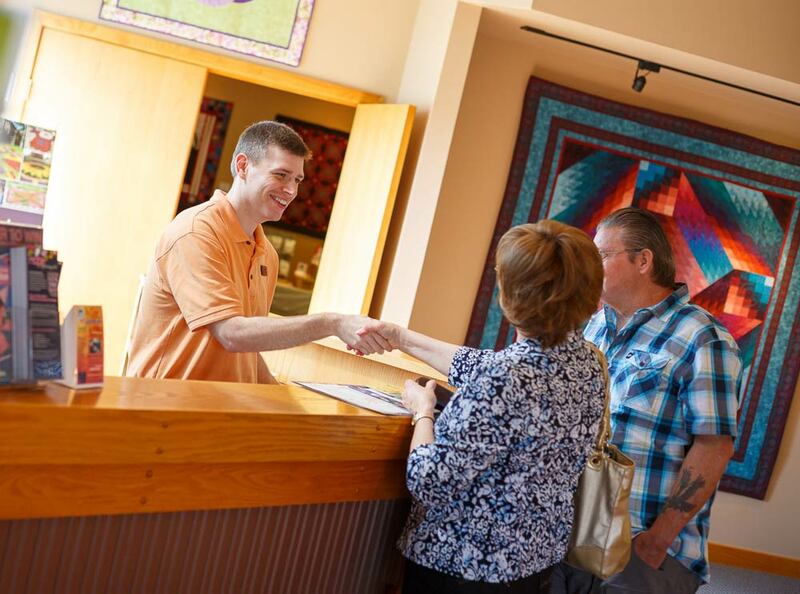 Ask anyone who stops in at the Elkhart County Visitors Center.